Human circulatory system. arteries shown as red, veins blue. A circulatory system, often referred to as a cardiovascular system, is an organ system that moves substances to and from cells; it can also play a part in homeostasis by helping stabilize body temperature and pH. Three types of systems exist (from simplest to most complex): no circulatory system, open circulatory system, and closed circulatory system. The Mammalian circulatory system reveals a complex and harmonious coordination of giving and receiving between different systems, including the respiratory system, immune system, lymphatic system, urinary system, and endocrine system. Via the circulatory system, oxygen and nutrients are provided to cells, while waste products from metabolism are removed; carbon dioxide and oxygen are exchanged in the lungs; hormones are moved from one endocrine organ to receptors in other parts of the body; and white blood cells and antibodies are transported to attack foreign agents. The mammalian circulatory system is analogous with the xylem and phloem system in vascular plants. An open circulatory system is an arrangement of internal transport in which circulatory fluid, in a cavity called the hemocoel (also spelled haemocoel), bathes the organs directly. There is no distinction between blood and interstitial fluid; this combined fluid is called hemolymph (also spelled haemolymph). Open systems are present in some invertebrates, like mollusks and arthropods. Muscular movements during locomotion by animals with such a system can facilitate hemolymph movement, but diverting flow from one area to another is limited. When the heart relaxes, blood is drawn back toward the heart through open-ended pores. The circulatory systems of all vertebrates, annelids (for example, earthworms), and cephalopods (squid and octopus) are closed, meaning that the blood never leaves the system of blood vessels, which consists of arteries, veins, and capillaries. In mammals, poorly oxygenated blood collects in two major veins: The superior vena cava and the inferior vena cava. The superior and inferior vena cava empty into the right atrium of the heart. The coronary sinus, which brings blood back from the heart itself, also empties into the right atrium. The right atrium is the larger of the two atria, although it receives the same amount of blood. The blood is then pumped through the tricuspid, or atrioventricular, valve into the right ventricle. From the right ventricle, blood is pumped through the pulmonary semi-lunar valve into the pulmonary trunk. This blood leaves the heart by the pulmonary arteries and travels through the lungs (where it is oxygenated) and into the pulmonary veins. The oxygenated blood then enters the left atrium. From the left atrium, the blood then travels through the mitral (or left atrioventricular valve), into the left ventricle. The left ventricle is thicker and more muscular than the right ventricle because it pumps blood at a higher pressure. Also, the right ventricle cannot be too powerful or it would cause pulmonary hypertension in the lungs. From the left ventricle, blood is pumped through the semi-lunar valve into the aorta. Once the blood goes through systemic circulation, peripheral tissues will extract oxygen from the blood, which will again be collected inside venules, then veins, and ultimately the vena cava and the process will continue. Peripheral tissues do not fully deoxygenate the blood, thus venous blood does have oxygen, only in a lower concentration in comparison to arterial blood. The release of oxygen from erythrocytes (red blood cells) is regulated. The diffusion of oxygen from red blood cells increases with an increase of carbon dioxide in tissues, increase in temperature, or a decrease in pH. Such characteristics are exhibited by tissues undergoing high metabolism, as they require increased levels of oxygen. Many mammals are born with defects in the circulatory system, which can lead to abnormal blood flow and oxygenation in the body. In humans, these conditions may manifest as "cyanotic spells" ranging from a young age to adulthood, or even as overt cardiomegaly and repeated chest infections. These conditions rarely are corrected naturally, and usually require invasive surgery for correction. If undetected and left alone, the majority are fatal. An example of organisms without circulatory systems are the flatworms (phylum Platyhelminthes). Their body cavity has no lining or fluid, but rather a muscular pharynx leading to a digestive system. Digested materials can be diffused to all the cells of the flatworm due to an extensively branched digestive system and being flattened dorso-ventrally. Oxygen can diffuse from water into the cells of the flatworm. Consequently every cell is able to obtain nutrients, water, and oxygen without the need of a transport system. Several measurement techniques exist to test cardiac function. These techniques are often employed by physicians to diagnose cardiovascular diseases and ailments. Stethoscope—used for auscultation of different heart sounds and flow changes through arteries and veins in the body; also employed to listen to breath sounds as well as bowel sounds, etc. Cardiovascular disease refers to the class of diseases that involve the heart and/or blood vessels (arteries, and veins). While the term technically refers to any disease that affects the cardiovascular system, it is usually used to refer to those related to atherosclerosis (arterial disease). These conditions have similar causes, mechanisms, and treatments. The valves of the heart were discovered by a physician of the Hippocratean school around the fourth century B.C.E. However, their function was not properly understood then. Because blood pools in the veins after death, arteries look empty. Ancient anatomists assumed they were filled with air and used for its transport. Herophilus distinguished veins from arteries, but thought that the pulse was a property of arteries themselves. Erasistratus observed that arteries that were cut during life bleed. He ascribed the fact to the phenomenon that air escaping from an artery is replaced with blood that entered by very small vessels between veins and arteries. Thus, he apparently postulated capillaries, but with reversed flow of blood. The second century C.E. Greek physician, Galen, knew that blood vessels carried blood and identified venous (dark red) and arterial (brighter and thinner) blood, each with distinct and separate functions. Growth and energy were derived from venous blood created in the liver from chyle, while arterial blood gave vitality by containing pneuma (air) and originated in the heart. Blood flowed from both creating organs to all parts of the body where it was consumed, and there was no return of blood to the heart or liver. The heart did not pump blood around, but rather the heart's motion sucked blood in during diastole and the blood moved by the pulsation of the arteries themselves. Galen believed that the arterial blood was created by venous blood passing from the left ventricle to the right by passing through "pores" in the interventricular septum. Air passed from the lungs via the pulmonary artery to the left side of the heart. As the arterial blood was created, "sooty" vapors were created and passed to the lungs, also via the pulmonary artery to be exhaled. 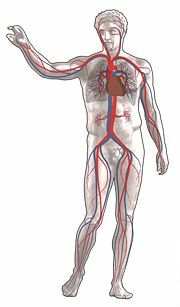 In 1242, the Arab scholar Ibn Nafis became the first person to accurately describe the process of blood circulation in the human body. Contemporary drawings of this process have survived. In 1552, Michael Servetus described the same, and Realdo Colombo proved the concept, but it remained largely unknown in Europe. Finally, William Harvey, a pupil of Hieronymus Fabricius (who had earlier described the valves of the veins without recognizing their function), performed a sequence of experiments and announced, in 1628, the discovery of the human circulatory system as his own. He published an influential book, the Exercitatio Anatomica de Motu Cordis et Sanguinis in Animalibus, about it. This work with its essentially correct exposition slowly convinced the medical world. Harvey was not able to identify the capillary system connecting arteries and veins; these were later described by Marcello Malpighi. Haynes, R. H. 1963. Physical aspects of the mammalian circulatory system. Journal of Rheology 7(1): 19-24. Iskandar, A. Z. Comprehensive Book on the Art of Medicine by Ibn al-Nafis. Retrieved May 2 2005. Nie, J-b. 2001. Refutation of the claim that the Ancient Chinese described the circulation of Blood. New Zealand Journal of Asian Studies 3(2)(December): 119-135. This page was last modified on 3 April 2008, at 19:13.